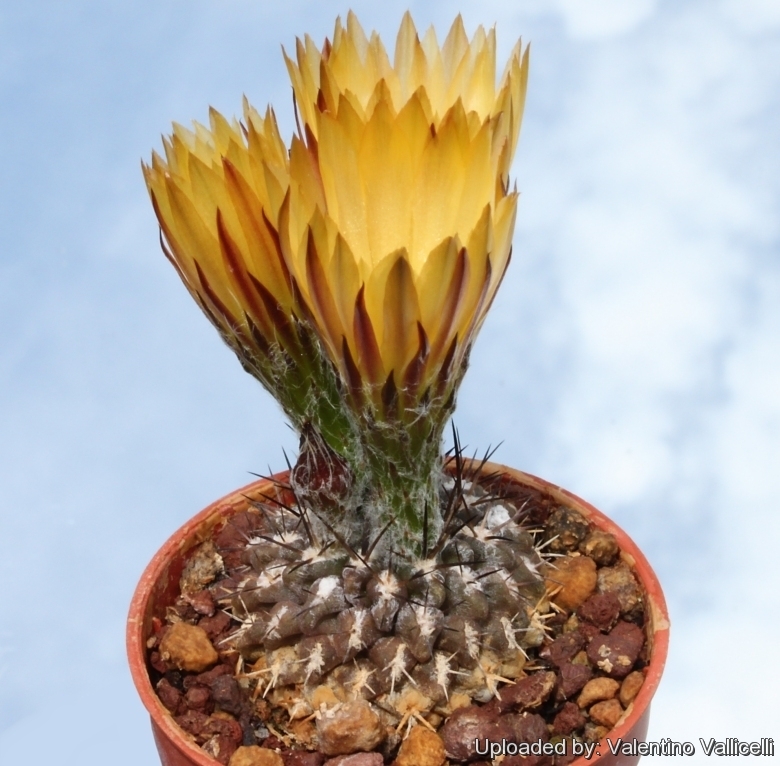 = Pyrrhocactus deherdtianus (Backeb.) Katt. Altitude: 300-400 (-800 ?) metres above sea level. 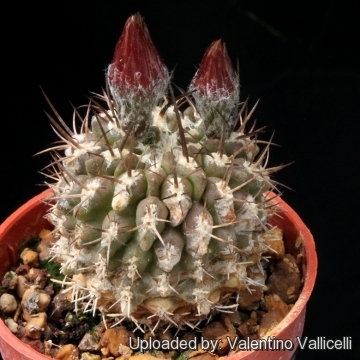 Description: Eriosyce deherdtiana is a compact slow growing forms of Eriosyce heinrichiana that distinguishes for the dark maroon/mauve stems whit fewer tuberculate ribs. 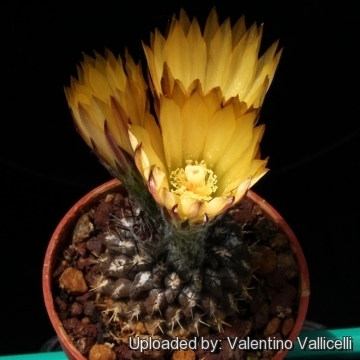 However it look similar to other varieties of Eriosyce heinrichiana which are linked one to each others by populations of plants with intermediate characteristics. Habit: It is a tiny geophytic cactus rising barely above ground level (in habitat), usually solitary or sometime branching. Stem: Spherical to somewhat clavate in cultivation, flattened at the apex, up to 8 cm tall (but usually less than 4 cm) and 4-5 cm in diameter, dull olive-green, dark maroon/mauve to blackish. Areoles: Elongate, with yellowish or white felt. Ribs: About 12, noticeably tubercled with pronounced chinlike protrusions. Spines: About 7 stiff, needle-like, straight or more or less curved and not easily distinguished as centrals or radials, creamy white, brown or black and darker at the tips, turning grey as they ages. Flowers: Diurnal, 3-4 cm long and broad, closely packed apically from young areoles, funnel-form, the colour is creamy yellow to reddish often with red/brownish midveins. Pericarpel and floral tube with bracts, wool and sparsely bristly. Blooming season: Flowers are produced in early summer and remain open for about four days. 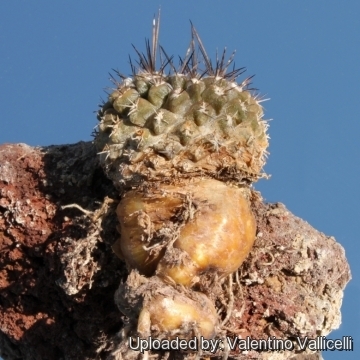 Cultivation and Propagation: Eriosyce deherdtiana (syn: Eriosyce heinrichiana) is a slow growing but relatively easy to grow species, providing they are kept dry during autumn and winter and rot prone if kept in a non ventilated place.